Goalposts at Roberts Crescent Park have been repeatedly vandalised. 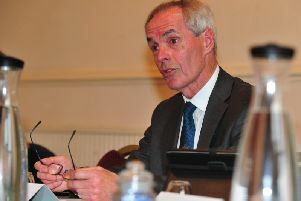 A former councillor has urged North Yorkshire Police to increase their patrols in Bilton to tackle a wave of anti-social behaviour and vandalism. Val Rodgers warned some residents have been so worn down by spates of mindless damage that they have just become resigned to it - citing cases of repeated vandalism of goalposts at Roberts Crescent Park, damage to church buildings, and stones being thrown at houses. She said: “Residents are despondent, and although I encourage them to report all incidents on 101, they think it’s a complete waste of time. They don’t think anything will be done about it when they report it. “Bilton is a great, caring community, and it’s just such a shame that we have this small group of people causing this trouble. We need police patrols to be increased, and parents need to know what their children are doing. A North Yorkshire Police spokesperson said: “North Yorkshire Police encourage people to report any incidents of anti-social behaviour. Any information we receive about anti-social behaviour issues helps us to identify any patterns in offender behaviour and determine where we need to target our resources.